Wildly Popular Girls 2 piece Cotton sleepwear. Dog Tired Pyjamas for Girls with Pale Pink long sleeve top and "Dog" Graphic on front and crew neck. Long Pink pants with allover dog print completes the set. PinkBear Hug Print Pyjamas. Longsleeve top with Bear graphic with contrasting collar and cuffs. Pants have stretchy waistband and allover footprint pattern with contrasting waist and ankle cuffs. Fitting nice and snug, the top and bottoms easily slip on to get cuties ready for a fabulously well-rested night. Wildly Popular Girls 2 piece Cotton sleepwear . Duck Duck Moose Pyjamas for Girls with Pink long sleeve top and "Ducks and Moose" on front and crew neck. Long Pink pants with allover ducks and moose print completes the set. Girls 2 piece Pjs Set from French Canadian brand Petit Lem. This adorable 2-piece cotton sleepwear set includes pink long-sleeve top with glittery ice skates on the front with multicolored spotted long pyjama pants. Girls 2 piece Pjs Set from French Canadian brand Petit Lem. This adorable 2-piece cotton sleepwear set includes fuschia long-sleeve top with owl princess on the front with allover multicolored owl print long pyjama pants. Colorful Carters Girls Elephant Print 2 piece Pjs Set. This adorable 2-piece cotton sleepwear set includes long-sleeve top with allover multicolored elephant print, long pyjama pants with multicolored elephant print. Carters Girls Monkey Ballerina 2 piece Pjs Set. 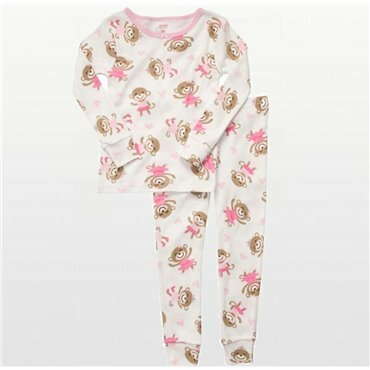 This adorable 2-piece cotton sleepwear set includes white long-sleeve top with allover Monkey Ballerina print, long pyjama pants with allover Monkey Ballerina print. 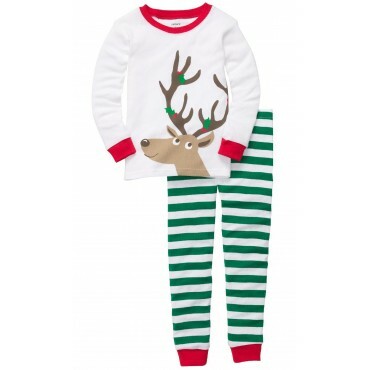 Carters Reindeer 2 piece Pjs Set. This adorable 2-piece cotton sleepwear set includes white long-sleeve top with contrast cuffs and a Reindeer Motif, stripped long pyjama pants. Carters Red and White stripped 2 piece Pjs Set. This adorable 2-piece cotton sleepwear set includes embroidered long-sleeve top with contrast cuffs and stripped long pyjama pants.